A CASSEL METALSHARK 2 model GFS-150-RV drop-through metal detector for industrial manufacturing and packaging process applications. THRU-TUBE: 6 inch diameter by 24 inch long anti-static plastic through-tube with stainless steel end connections. MOUNTING FRAME: The metal detection search head enclosure comes mounted inside a 19 5/8 inch wide by 16 5/8 inch long by 20 inch high tubular stainless steel frame, with angle cross pieces for mounting in place as needed to support your product inspection application / usage. --PLEASE NOTE that the pictures show this metal detector and control panel sitting on top of an OPTIONAL frame with casters that we use for showroom display purposes, and is not included with this metal detector, but is available separately (CALL us at 315-589-4511 for a quote specific to your metal detection requirements). REJECT DIVERTER (NOTE: available with, or without): Stainless steel high speed pneumatic Y-valve reject valve, with 6 inch diameter discharge outlets; 35 inch free-fall from inlet to bottom discharge with reject diverter in place. CONTROL PANEL: Touchpad operator control panel connected by 6 foot long cord so as to facilitate mounting for convenient access, with a 5.4 inch color screen, RS-232 and RS-485 serial data acquisition ports, and ethernet data interface, in a T316 stainless steel enclosure. Optional data logging software is available for tracking and reporting for HACCP and other quality assurance and certification regimes. FOOD GRADE SANITARY: A food grade metal detector specifically built for food processing and other industrial production line metal detection applications. All food grade / USDA sanitary hose-wash-down stainless steel onstruction (IP-67/NEMA 6 search head enclosure, IP-65/Nema4,4x,6,12 & 13 control enclosure). UTILITIES: 110 volt single phase (standard household current) electrical input. Compressed air pneumatic line also required to operate reject valve. SENSITIVITY: Metal detection sensitivity varies depending on product run (determined by product characteristics), especially where wet, salty, or acidic products that are electrically conductive introduce "product effect" into the equation, however the manufacturer rates dry sensitivity for this head, with no product in the aperture, at a maximum sensitivity of .8mm ferrous, 1.1 mm non ferrous, and 1.3mm stainless steel. The control unit allows for 120 product presets. EASE OF MAINTENANCE: Single control board technology with all control electronics on one circuit board maximizes reliability, and minimizes maintenance expenses. T316 stainless steel construction: T316 stainless steel is an extremely high-grade of stainless, more corrosion resistant than standard 304 type stainless steel, and suitable even in corrosive process environments, such as in processing onions, peppers, brines, tomatoes, citrus products, etc. 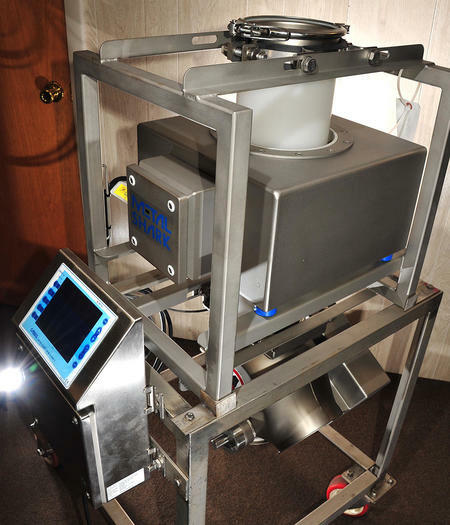 Gravity free-fall metal detection systems are commonly used for free-flowing granular and / or particulate products, as well as sliced, diced, shredded and whole products in food manufacturing and other industrial production applications. Gravity flow metal detectors are commonly mounted under feed hoppers, under mixer / blender discharges, or on filling machines, such as for metal-checking between scales and form-fill-seal or other types of baggers. As of this writing, this NEW industrial process gravity free-fall metal detector is in stock NEW at Alard, available for immediate shipment. CALL 315-589-4511 to confirm current availability, and to dicuss the details of your industrial process metal detector needs. This page contains a single entry by Michael C. Shults, Alard Equipment Corp published on November 28, 2018 6:17 PM. Video demo - Urschel model M cutting salmon dices, Y3875 was the previous entry in this blog. 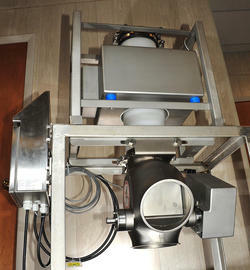 VOLUMETRIC FILLER, adjustable fill, food grade, FMC Hand Pack, Z8711 is the next entry in this blog.